There is a circuit of juried shows and a circuit of judges for them and this ritualistic gravy train has come for me many times over the past twenty years or so. The tropes come and never go. The predictability sets in with what is submitted. Judges dilemma: Does one reward an artist for making an adequate version of a popular, established (maybe even a favorite) painter? If you go into one of these with the philosophical questioning of what originality is, well you’re gonna walk out hoping there isn’t such a thing, because the truly, truly original stuff submitted to these contests scalds your eyballs… (Jack Nicholson voice): You can’t handle originality! For the first time in my memory, this exhibit brought overt political art, and not just a little bit of it. If art is the pulse, looking at all the work submitted tells me the pulse is moving on and the world we once knew has ended. 2014 has more in common with 1999 than it does 2017. The great artists from just a few months ago are sealed up on display in acrylic boxes (haven’t you heard?) …neutered. Where does that leave us? Well it basically leaves us lost. But that is good, because without a map or destination we are free. Free to fight the wars of our choice. A phrase on a FaceBook friend’s page caught my eye: “Art is a flag flying above a smoking battlefield” (Andrew Auten, 2017). That is 2017. This is my curation of that flag. This show was curated, not juried. A juried show reveals how guilty a juror feels for their taste. The whole act of jurying is compromises made to compensatefor none of the sculptors submitting being Louise Nevelson and none of the abstract painters being Robert Motherwell and none of the hummingbird painters being interesting and so on. A curated show is an exhibition. This show was approached as a curated art show. There is a theme to this show: Art Is A Flag Flying above A Smoking Battlefield. Basically, and unapologetically, this is an exhibition of flags flying above a smoking battlefield; it is meant to be personable and weird, icky in some places anexalted in others. It is 2017. Put this in a drawer or a box and see how weird it really was, how separated it was from the first half of the decade. Think about it when you look back on 2017 in 2030, okay? Some of these images mean something to me. Some of the art here would have made the “just jurying” cut,picking the little categories off with my jurying BB gun to make sure everything antiseptic and safe about art was assured. But with this curator you aren’t getting academic jargon meant to dissuade you from standing up. The work in this show was chosen as something for you to look up at thru the smoke of where you are in your mind and life right now. The universal truth in which the curator is just some objective lout in the corner with his or her arms folded is gone. It was born in the salons of pre-modernity and it maybe made it to 2014… but since then a universe has come and gone, objectivity and the pretenses toward it are at best now fake theory. It is 2017, a new world, a smoking battlefield, and there is NO neutrality. None. You say something, you mean it. You post something, you believe it. The wars abound and there is no irony in picking a side (it could be a matter of life or death). We are erasing a binary while the chiaroscuro of the mundane sharpens. Breathe deep, for, as Devo sang, we’re going under. I fly the work in this show above our smoking battlefield. teams, especially the A’s, he lives with his wife (artist Leigh Salgado) and dog (Aybar) near the city of Vernon, just south of Downtown L.A.
Lindy Chambers lives in rural Texas, almost halfway between Houston and Austin. She spends a lot of time by herself in her studio, outside with her animals or driving on country roads watching the scenery pass by. In those places she notices the simple things which serve as the inspiration for her work. The American dream usually signifies the sort of freedom that allows for upward mobility, for prosperity as achieved through hard work in a society with few barriers. For many, it is symbolized by the prospect of home ownership or retirement or the acquisition of possessions, but it is not built on notions of wealth and advancement alone. At its root, the American dream represents the intangible aspects of optimism and the innate capabilities of every individual to succeed on their own terms. Many say that characteristic optimism is being challenged, perhaps most notably acknowledged by President Obama in his inaugural address when he urged Americans not to heed the “nagging fear that America’s decline is inevitable, and that the next generation must lower its sights.” Almost eight years later, that pessimistic outlook is still palpably familiar. However, Chambers does not portray it as grim, but rather as a beautiful return to simplicity. The American dream, she says, is not dead or gone, it’s just hiding out of plain sight. She explains that artists are seers whose job it is to notice what the rest of us miss, to point it out and offer visual explanations. Chambers offers that description in color and light. The initial palette for her work is inspired by the paint on the mobile homes themselves, often painted in the bright colors characteristic of Mexico, but she takes them far beyond that initial prompting. For her, color is a language capable of storytelling and she takes advantage of the vast range of pigments to tell each painting’s tale. Inspired by color theorist Charles Hawthorne, Chambers experiences the world in color. When she first views something, she notices the contrasts between lights and darks, then moves on to other details like the shapes of objects or the shades of blue and brown in a puddle. In each painting, Chambers tries not to use the same color twice, a testament to painting what she truly sees. Her color choices are also strategic, using it to blend together a range of styles that don’t ordinarily lie together on the same canvas. Each painting has strong elements of abstract and impressionist techniques, as well as forms that are cartoon-like in character. The most important things are portrayed in abstract color — the trees, the homes, but mostly the animals. Chambers doesn’t include the human inhabitants in her paintings, instead their life is imbued by the character of the critters and what they say about their human hosts. In stark contrast are the objects shown strewn about the yards — tires, cans and all kinds of trash. Each is depicted as a line drawing, painted in a consistent shade of beige that pops in contrast to the otherwise spirited color. “I depict [the trash as] flat because they don’t see it anymore, the people living there,” Chambers says. “It’s like they walk by it all the time and they don’t see it. It’s not important, so I don’t paint it. But if you look closely at the trash in the paintings it is anything but forgotten. In “This is for the Birds,” pieces of beige trash float in deeply blue pools of water collecting outside of a trailer on a dirt road. An unattended dog wanders away, almost unnoticed as the eye is drawn irrevocably to the beige objects. The contrast between the color of the painting and the cartoony plainness of the floating debris brings a three dimensional sense to the paintings. From that depth comes the character of the people inside accompanied, if only you pause to notice. Chambers has done more than 70 paintings of mobile homes, and a few of her more recent pieces only depict the trash that she finds there. This transition from people, to home, to trash is the evolution of the American dream as it changes from visions of fancy mansions and wealth to more humble ideals of working hard to seize the opportunities afforded. While Chambers admires that lifestyle, it is not one that she calls her own. She lives in a big, old house out in the country and spends most of her time in her studio, her favorite place. She says that when she hosts visitors from nearby Houston, they always comment about how dark it is out in the country, how quiet and how unnerving they find that to be. “Aren’t you afraid of the dark?” they ask. “No, I love it,” Chambers replies. On the Bill: Ten by Sixty. The Dairy Arts Center, 2590 Walnut St., Boulder, 303-440-7826. Through July 4. Exhibition reception, Friday, June 17, 5 p.m.
SILVER - Lindy Chambers, "What the Heck," 2015; Oil on board, 30 x 30 in. In a wildly colorful trailer-park setting, red and green beach chairs are left outside, dwellings are up on cinder blocks, multiple satellite dishes receive reality T.V., and discarded rubber tires collect weeds. We've entered a place where nothing is subtracted, so objects rapidly accumulate. It is here that Lindy Chambers sets the stage for magical events to happen. Hello Kitty is rounding the corner, incredibly, each small mobile home is adorned with cubist-inspired painting. In the midst of this inexplicable combination of images, the specter of two canines in dialog is delightfully convincing. Aptly named "What the Heck," the title has at least two interpretations. One being "shy" and another being "why not." The composition contends with the paradox of order/disorder. The same scene presents us with a lack of order in the tin cans and bottles that litter the ground, and a unifying order as the trailers on the left and right create a focal point where two genteel dogs sit in what can best be described as polite conversation. Chambers colors are at times logical, for example the green grass, black rubber tires, Weber barbeque grill, and the dog with the brown muzzle. More often, she dreamed up the colors. A blue dog exists instead of a blue sky. We see an interlocking system of geometric pieces in kelly green, lime, purple and blue overhead. The scale at 30 x 30 inches is certainly large enough to engage the viewer. I would be interested to see works even larger, it would be wonderful to enter this fantastic real at about 60 x 120 inches. The work is painted directly a skilled artist who is tapping folk style for its immediacy. This is a perfect match for the subject matter of grassroots American living. The illusion of depth is created by the use of diagonal lines of the trailers, the shaded color of deep purple that lifts the structures off the ground, and by the relative sizes of the objects such as the smaller, fainter trailer in the rear. I am reminded of the Bay Area painter, Roy DeForest who generated similar excitement with his mesmerizing "Country Dog Gentlemen." What a hoot to see another artist work with dogs without tripping up and slipping into kitsch. Kitsch is what happens when a picture tries to manipulate its viewer too deliberately to elicite sympathy or attraction. Could this be why Hello Kitty is here? Kitty, invented by a company called Sanrio, is prime example of Kawail, which in Japanese as "loveable" Perhaps Kitty is here to state the obvious, to introduce notion of kitsch in order to disarm the critics beforehand, Kitty is recognizable across cultures and suggest the power of images when backed by plenty of capital investment. My sense is the Kitty is simply a toy inserted to remind us that we can come out to play. There is no particular reason the Kitty is here and that's the beauty of it. The sky is patterned, dogs are blue, and abstraction decorates the sides of mobile homes because this is a painting not a photograph. Anything can happen, Hey, what the heck? The artists is in charge and the viewer wants to see things not as they are, but how they might be, if burnished with enough imagination. And to that I say. Hell Ya.! 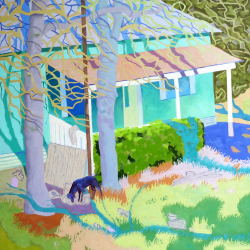 "Lindy Chambers paints scenes of "off-the-grid" lifestyles with clarity and vigor. These are not the homes of eco-warriors or members of an artisan movement, but rather the cheap, temporary houses of unskilled workers and day laborers. Chambers uses color to carry these buildings over into the realm of the fantastic. The risk in painting scenes like these in colors such as these is being considered a kind of Rousseauan pure soul who paints this way out of innocence. But Chambers maps her pictures carefully. She begins with sketches and tonal studies. Her framing is unusual but effective. Colors are chosen to make a lasting impact. There is a sense of spontaneity and great patience in each of these paintings. The visionary aspect promises to outlast reality in which the houses are abandoned and collapsed. Chambers is inspired by the trailer houses set off from county roads near the small town where she lives in southeast Texas. Each painting starts from an actual or abandoned residence. She uses oil paint and gloss to transform distressed places into lambent scenes. Detritus piled up in the yards is painted monochromatically; corrosion and encrusted filth do not appear. Time in these paintings is not measured by decay but by the growing things. In the painting All strays are black, a forest is overtaking a home." You didn't have to cut me like that, features a large tree that has been disfigured by the electric company, which regularly shears trees so that their limbs do not weigh on the power lines. One is impatient for a time when the tree returns to fullness. The title suggests there is an alternative to corporate expediency, a balance between the growth of nature and the currents that drive progress. A solution is not evident in the picture, but seeking out such a balance is part of the artist's project. Shelter and nature are the dynamic in these pictures. Electric wiring is the civilizing taproot of the trailers. At the same time, the "right of way" of the power lines causes intense shearing or the removal of trees-trees that cloak the modest living spaces, redeeming down-at-the-heel- lifestyles with vibrant growth and color. And yet this growth that, as we have seen in All strays are black, doesn't want to stop at walls. Dogs rule and It is what it is afford temporary, perhaps even pirated, elctricity poles special places in the frame. Their unsteady state is balanced by the vigor and schemes of the animals. Chambers' framing deepens a sense of the complicity of all created things in some sort of joint interprise. Everything is linked in some design. Chambers doesn't say what she thinks that design is, but she does have an ecumenical vision. Whatever sense of authority there is, whether the trees, shelters, high tension wires or an alpha dog standing over weaker ones, each part creates a balance. Powerful and meek are of a piece and everything is made brilliant with color. The beautifully colored trailer and rich grass in My place to live shine brightly within a cage of power lines. Another such cage is implied in As good as it gets. But that doesn't matter to the goats and dogs haveing a field day on the disused autos and other industrial and domestic trash piled up in the yard. And there is a hilariously funny rhyme at work with the glass backboard of the basketball goal in the windscreen of a car that has somehow gotten up into a tree. The people that live in these houses are gone off to their hard jobs, or else they are private and stay indoors, out of the artist's gaze. The evidence says a lot about them. Broken machinery is kept around for spare parts. Tires are stacked up like canned vegetables. These people saving up for the worst or living through the worst. Bits of comfort show up like grace notes: shady trees, window a/c units, satellite TV dishes. The husbandry of animals is also in evidence. These animals, even the strays, are vigorous, playful, and seem pleased with the lurking places detritus affords them. For all the non-biodegradable trash piled up in these places, the animals create a feeling sort of like forgiveness. Their utter lack of judgement is a joy to see.